it is the smartphone with the speed you need, all original accessories and at awesome discounts. Value for money phone from Samsung. Loved that teardrop design with thin bezels. The phone is very slim, light and feels premium in the hand. The battery backup is also very decent and so is the performance. You can definitely buy this device if you&apos;re planning to. A perfect smartphone for those who&apos;re tight on the budget. Another good smartphone from Samsung. Perfect for those who&apos;re very bored from Chinese companies. I like the pricing of this phone making it a value for money option. Everything about this device is great - display, build, battery and performance. Software is something which you&apos;ll have to decide yourself. If you can buy the M20, then go for it. But still this phone is also very nice considering the price. It is value for money option if you want to save some bucks. You do need a used to the Samsung software. I am not a big fan of it but you might like it. Apart from software, I liked every single thing about this phone. Samsung has done wonders here. 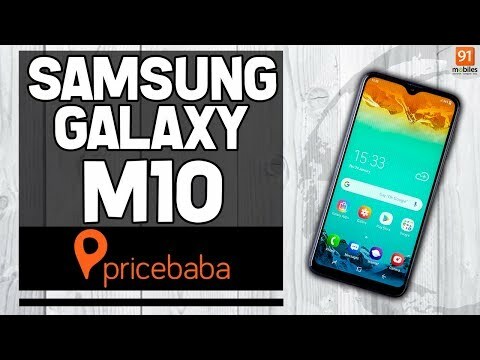 4 Pricebaba users have written their experience with Samsung Galaxy M10. If you own Samsung Galaxy M10, please do leave your feedback too. Lowest price of Samsung Galaxy M10 price in India starts at Rs. 7,990 Samsung Galaxy M10 is available on Amazon at Rs. 7,990. Prices updated on 22nd April 2019. The Samsung Galaxy M10 comes with decent features at an affordable price. The bezel-less display comes with a waterdrop notch at the top that makes the screen wide enough to enjoy reading and watching videos. The powerful configuration makes it a good performer in multitasking. The optical feature is also very good to select this device over others. However, the Samsung Galaxy M10 lacks a fingerprint sensor, which can be marked as a huge drawback for this. The Samsung Galaxy M10 features an IPS LCD display of 6.22-inch. The display can offer a resolution of 1,520 x 720 pixels and a pixel density of 270 PPI. The smartphone comes with an aspect ratio of 19:9 and it has a waterdrop notch at the top. The device is based on a Samsung Exynos 7 chipset. The Samsung Galaxy M10 packs an octa-core Cortex A53 processor having the clock speed of 1.6GHz. It comes with a 2GB RAM that accompanies the processor to run smoothly while gaming and multitasking. For the graphics, there is a Mali-T830 GPU that shares the load of the processor. The operation is done by Android v8.1 (Oreo). The Samsung Galaxy M10 sports a 13MP primary camera at the rear and a 5MP lens at its frontal side. The frontal lens is placed in the small notch at the top of the screen. The main camera is assisted by additional features like Auto Flash, Bokeh Effect, Continuous Shooting, Exposure compensation, Face detection, High Dynamic Range mode (HDR), ISO control, Touch to focus, White balance presets and can capture amazing pictures. In terms of connectivity, the Samsung Galaxy M10 has several options including Wi-Fi, Mobile Hotspot, Bluetooth, GPS and more. The device comes with 16GB internal storage that can store multiple files of songs, videos and many more. The Samsung Galaxy M10 also has an option like memory slot that can be used for an external memory of 512GB when required. The smartphone draws the charge from a Li-ion battery of 3,400mAh. The battery can give a decent back up for hours to keep it alive. The Samsung Galaxy M10 comes with several options in the sensor department. It has Accelerometer, Proximity Sensor, Gyroscope to perform better.